The Court of First Instance in Tunisia issued a verdict on Friday prohibiting the entry of an Israeli delegation to into the Tunisian territories to participate in a conference on religions. The Appeals Chamber of the Court of First Instance in Tunis on Friday prevented the entry or accommodation of the Israeli delegation to participate in the World Forum for Interfaith Dialogue. 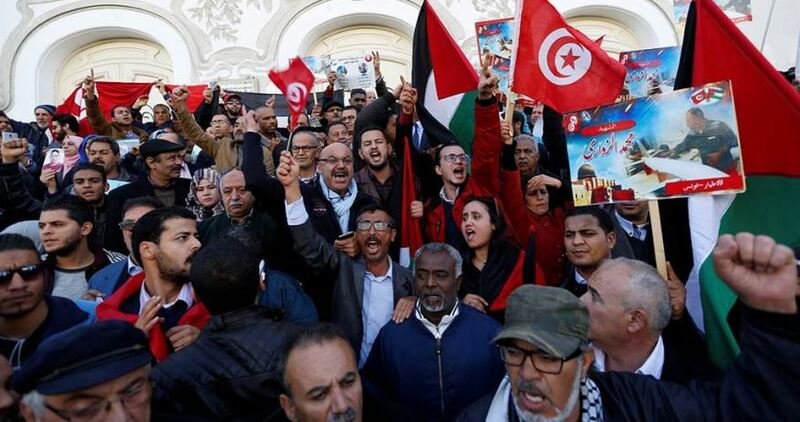 The case was filed against the Tunisian Scout organization by the National Commission for Supporting Arab Resistance, Anti-Normalization and Zionism, the Republican Party, and the People's Movement. These bodies demanded that the organization be prevented from receiving, hosting or allowing the participation of representatives of the International Forum of Jewish Scouts and all those who hold Israeli citizenship at the World Forum for Interreligious Dialogue, to be held between 4 and 8 November. For its part, the Tunisian Scouts Organization denied it had any intention to host Israelis as part of the projected forum, stressing the group’s unyielding pro-Palestine position and support for Palestinians’ right to establish an independent state with Jerusalem as its eternal and undivided capital. Islamic Resistance Movement Hamas hailed the court ruling, dubbing it a sign of Tunisians’ genuine sympathy with the Palestinians throughout their anti-occupation struggle. Four European countries—Britain, France, the Netherlands and Sweden—have sent a letter of complaint to the UN Security Council president, criticizing Israel's Ambassador to the UN Danny Danon's harsh remarks to B'Tselem Executive Director Hagai El-Ad. El-Ad, an Israeli citizen, was invited to speak at a Security Council session about the Middle East, where he delivered scathing criticism of Israel. Danon, in response, slammed El-Ad, adding "Shame on you, collaborator" in Hebrew. "We welcome the invitation of Hagai El-Ad, the executive director of B'Tselem, to give a briefing to the Security Council on the Middle East, including the Palestinian question," the four countries wrote. "It was very appropriate to include the aspect of human rights in this discussion. The Council's discussions are enriched by such invitations... it's important these individuals and organizations come to the Council without having to contend with personal attacks." "The remarks by the Israeli ambassador to Mr. El-Ad were very unfortunate. They were made in a language to which there was not interpretation at the council (Hebrew), violating the basic rules of the Council, which are put in place to ensure we understand one another. It's important that the president of the Security Council emphasizes the importance of using one of the six official languages of the UN," the letter went on to say. Danon slammed the four countries. "Some of the European countries praise, support and generously fund an organization that comes out against IDF soldiers, against the State of Israel and against its judicial system, instead of pursuing truth and justice. It would be more appropriate for these countries—which provide oxygen to the organization via massive funding that leads to increasing BDS activity around the world—to condemn its activity with a clear, firm voice. Despite that, unfortunately, they call the B'Tselem executive director's remarks against IDF soldiers a 'contribution to the discussion,' while not revealing the funding they provide him." Danon went on to charge that "The B'Tselem organization presents everything except for the truth, and it is our duty to fight against its lies. Its close ties with countries that have anti-Israeli agenda such as Bolivia, and its presence alongside the Palestinians, only strengthen the claim it collaborates with those who seek to harm us." It is in the interest of Israel for Jewish Americans and Jewish Europeans to feel unsafe. The massacre of Jewish worshippers on Saturday by an avowed anti-Semite in Pittsburgh reveals a clear, straight line between Trump's sustained dog-whistles - against Jews, black people, Muslims, immigrants and members of the LGBTQ community - to the violence carried out by right-wing white nationalists. Robert Bowers, apprehended after a shooting spree that killed 11 people, explained he wanted "all Jews to die" and described immigrants and asylum-seekers as "invaders" of the United States. Instead of condemning far-right nationalism, Trump reinforced this hysteria, tweeting on Monday that a caravan of asylum-seekers coming from Honduras should be considered as an "invasion" and that the US military "would be waiting" for them. Last week, Trump proudly embraced the "nationalist" term. Bowers had consumed and regurgitated the lethal rhetoric of far-right extremists who want to rid the US of non-white, non-Christian people, and of a government which constantly incites hatred and vilification of all marginalized groups. Three days earlier, a white supremacist in Kentucky set out to kill black people. He eventually murdered Maurice Stallard, 69, and Vickie Lee Jones, 67, in a grocery store. There is no question that these killers were motivated by the white nationalist extremism the Trump administrations has adopted and encouraged. After Saturday's synagogue massacre, curiously, Israeli leaders offered their condolences but refused to address Trump's responsibility for fuelling such anti-Semitic violence. Instead, they scrambled to provide cover for the US president while Israel advocates attempted to blame the rise in anti-Semitism on left-wing, anti-racist and anti-fascist activists who campaign for Palestinian rights. Why would they do this, especially when American Jewish support for Trump is overwhelmingly low, and while Israel claims to be the protector of all Jewish people? To whom - or to what - were they speaking? The unwillingness by Israeli leaders to confront such modern-day Nazism and the political forces pushing state-sponsored bigotry and hatred exposes that state's unsettling alliance with Trump and his agenda. For Israel, Trump has been the ideal partner in its efforts to crush Palestinian resistance and deny rights to African asylum-seekers while entrenching apartheid and systematic, unchecked violence against Palestinians in the occupied West Bank and Gaza Strip. Trump has, in turn, looked to Israel to model his policies of intensified militarisation of the US-Mexico border, his authoritarian threats against asylum-seekers and immigrants, and his open embrace of nationalist figures and right-wing legislators. Notorious white supremacist Richard Spencer, speaking about his dream to make the US a European ethno-nationalist state, for example, has said he sees Israel as the ideal model. Spencer has even dubbed his project for an Aryan state "white Zionism." Brazil's president-elect, Jair Bolsonaro, a far-right extremist who has promised to treat social movements as terrorist organisations and wage a war on poor and indigenous communities, has also embraced Israel and says he will - like Trump - move his country's embassy from Tel Aviv to Jerusalem. Israeli flags were prominently waved during rallies celebrating Bolsonaro's win on Sunday, a chilling symbol of Israel's popularity in fascist political movements. But there is another reason Israel is embracing today's white nationalists. Right-wing extremists openly yearn to push Jewish people out of the US and Europe - a fantasy shared by Israel's top leadership. The appeal to Jews to leave their homes and settle in Israel - on Palestinian land - is a main tenet of Zionism, Israel's state ideology. But only a tiny number of ideologically motivated Jews are prepared to leave the safety, prosperity and comfort they enjoy in their home countries in North America and Europe for a hard life in Israel. Meanwhile, many Israeli Jews, especially the young and most educated, are leaving - a drain Israel is hard pressed to stop. So unable to attract Jews from abroad, Israeli leaders must convince Jewish people that they are unsafe and unwanted everywhere - everywhere except for Israel. Just like Trump, Israel's main weapon is fear. Israeli politicians like opposition leader Avy Gabbay - who on Sunday urged American Jews, in grief and traumatised by the Pittsburgh massacre, to emigrate to Israel - seek to deliberately weaken the safety and diversity of communities in which Jewish people around the world are rooted. Israel's education minister Naftali Bennett, an extreme right-wing supporter of Israel's settler population who has bragged about killing Arabs, used the massacre of Jewish worshippers to dehumanise Palestinians. The efforts of Bennett and Gabbay did nothing to assuage the Jewish community's fears, but they did exploit anti-Semitism for Israel's gain - and they gave Trump yet another tacit endorsement of his policies. Instead of fighting to make the world a safer place for Jews - for everyone - wherever they live, wherever they make their home, Israel's leaders and their supporters align openly with Trump's agenda even when it means siding with white nationalist movements who espouse deep anti-Semitism. 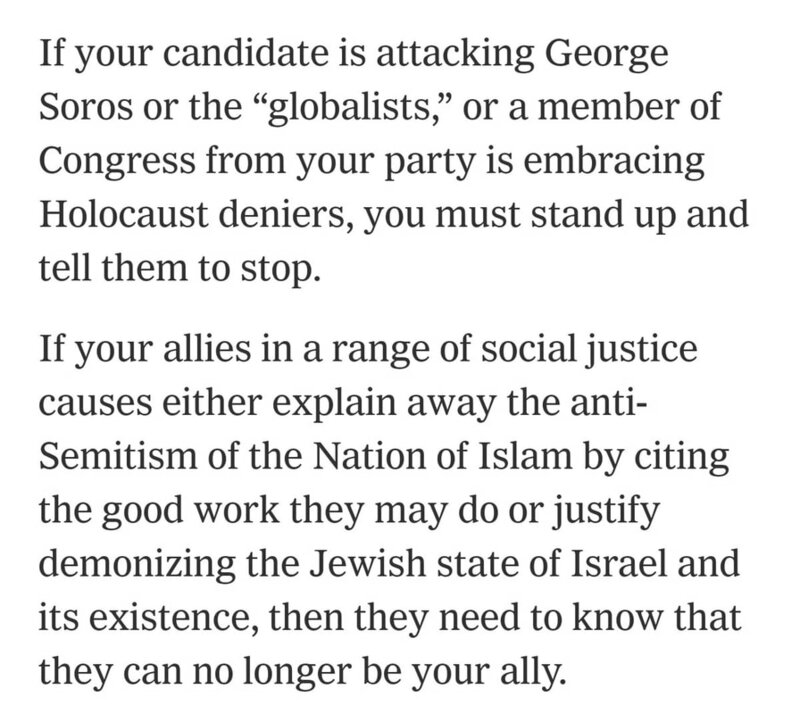 It's a horrifying and stark reality and one that Israeli leaders can only try to cover up by falsely deflecting the blame for the lethal anti-Semitism that visited the Tree of Life synagogue onto anti-racist activists and even left-wing Jewish groups. Israel and its lobby have spent millions of dollars in recent years on campaigns to conflate criticism of Israel with anti-Semitism, especially on US college campuses. They are trying to suppress the nonviolent, anti-racist boycott, divestment and sanctions movement for Palestinian rights by smearing it as anti-Semitic, while giving actual cover to anti-Semitism across the US. Israel's hardline advocates show deep contempt for American Jews who stand with the marginalised and oppressed, who reject Israel's unmitigated violence against Palestinians, who remain grounded in our communities fighting against systemic racism and injustice propagated by Trump and his authoritarian allies in Israel. 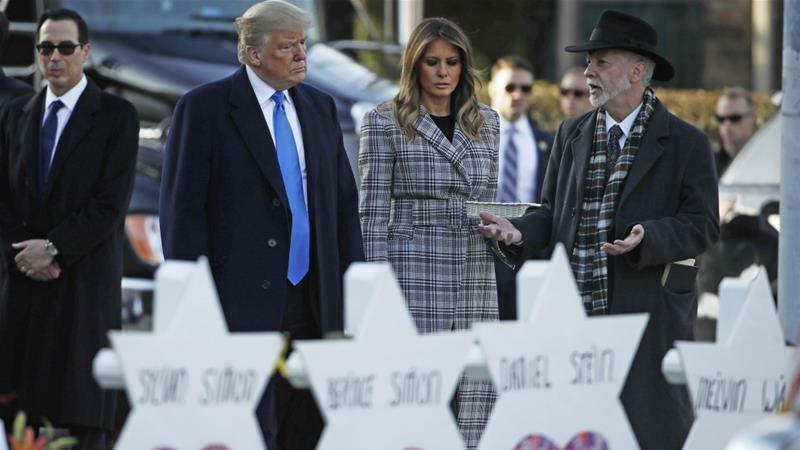 When Trump announced he would be visiting Pittsburgh, members of the progressive Jewish community there immediately stated that he was not welcome until he denounces white nationalism that targets Jews, migrant families, people of colour, Muslims, people with disabilities and LGBTQ people. He went anyway. Jewish communities in the US are drawing a line: as we refuse to accept Trump's right-wing nationalism that fomented the massacre in Pittsburgh, we also refuse to advocate for Israel as it embodies and sharpens that nationalist fantasy. Instead, we fight for a broad-based, inclusive and just future for us all. 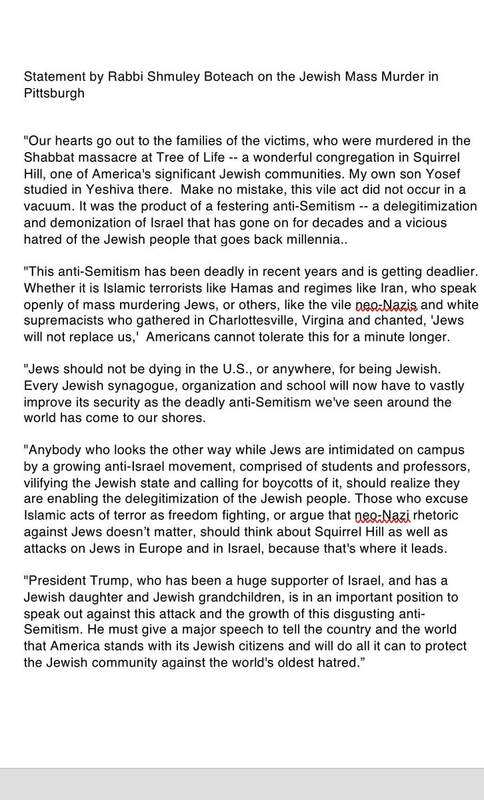 Yesterday during an interview on MSNBC, Ron Dermer, the Israeli Ambassador to the United States, placed the blame for the attack on both white supremacists and the “radical left,” which is clearly code for BDS activists. This is a disgusting lie. But it is part and parcel with the recent push by the Israeli government and its supporters in the West to redefine the meaning of antisemitism to include criticism of Israel. When faced the most blatant example of antisemitic violence imaginable, Dermer can’t bring himself to criticize the actual accomplices who made this violence possible. Donald Trump, who declared himself a “nationalist” earlier in the week, and the forces of white supremacy in this country have created the atmosphere where this type of violence is possible, even predictable. 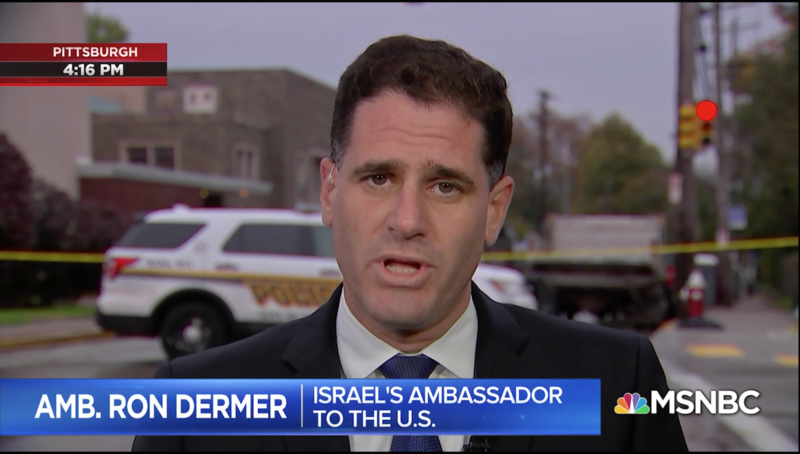 Yet during the MSNBC interview Dermer said Trump is to be praised for his statements on antisemitism, in no large part because the Trump administration has been a strong supporter of the rightwing Netanyahu government that Dermer represents. This is where Israel finds itself in 2018. The same “nationalist” voices attacking George Soros and the “globalists” are also some of Israel’s greatest supporters in the U.S. But it’s not just the Israeli government looking to use Pittsburgh. The murderous rampage at the Tree of Life synagogue had absolutely nothing to do with the struggle for Palestinian rights. And anyone who is telling you there is is shamelessly trying to use the murder of 11 innocent people to further their own racist agenda to dehumanize Palestinians and justify their ongoing oppression by the state of Israel. 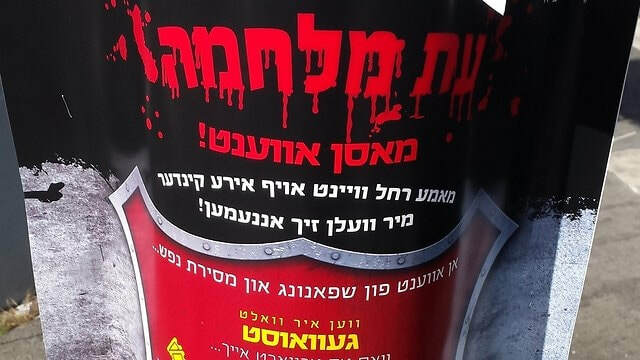 As part of their struggle to prevent the draft of ultra-Orthodox men and women to the Israeli military, radical Haredi activists distribute pashkevils in Brooklyn featuring Auschwitz to encourage fight against bill proposal. As part of their struggle to prevent the draft of young ultra-Orthodox men and women to the IDF or national service, radical Haredi activists in New York have recently put up pashkevils (posters on public walls) featuring the Auschwitz–Birkenau extermination camp, comparing the legislation meant to draft them to the Holocaust and calling on the public to continue the fight against the bill proposal. The amendment to the Israeli Defense Service Law passed its first hurdle in the Knesset in July. The legislation includes planned cuts to the yeshivot's budgets and the use of economic incentives to pressure the Torah study institutions to encourage enlistment to the IDF, but no criminal sanctions. The pashkevils, featuring a train arriving at the entrance of the extermination camp, were hung during the weekend across the Satmar community's stronghold in the Jewish neighborhood of Williamsburg in Brooklyn. "The train has passed! We'll stop it with self-sacrifice," the poster read. An additional poster titled "Time of war" promoted a Haredi conference against the draft law, which took place on Saturday evening. Alongside the usual call to oppose the enlistment of yeshiva students in Israel, the ultra-Orthodox community also focused on preventing the integration of Haredi women into national service or the recruitment of Jewish women to the IDF. "We are addressing our brothers in Israel, who engage in the sacred work of salvaging the oppressed from those who seek to harm the modest Jewish women," the banner read. In an effort to raise funds for the fight, the ultra-Orthodox community heads stated that "Everyone who has the power to act should guide the girls on how to carefully behave in order to avoid falling into the military's trap, and how they should act in case the army harasses them." A report issued by the Knesset’s Research and Information Center shows that regional councils in the West Bank receive the highest government funding, in comparison to other regional councils across the country. Regional councils in the West Bank receive the highest government funding in comparison to other regional councils across the country, according to a report issued by the Knesset’s Research and Information Center. The report was ordered by the Knesset's Transparency Committee Chairwoman Knesset member Stav Shaffir (Zionist Union). It determines that regional councils in the West Bank receive a quarter of Israel’s state grants, even though they represent only 5 percent of the country’s regional councils. “The Israeli Government doesn’t see its citizens, and lies to the residents of the periphery,” MK Shaffir said. The report gathered data from several sources and reviewed the funding the regional councils had received between 2015-2016 in education, and welfare as well as support grants from Ministry of Interior. However, the latest report did not include security budgets, as opposed to previous reports issued by the Knesset. According to the findings, a student in the settlements receives NIS 15,900 per year, while the national average stands on NIS 9,800. In addition, it was found that support grants to regional councils in the West Bank are larger the the ones other Israeli regional councils receive. 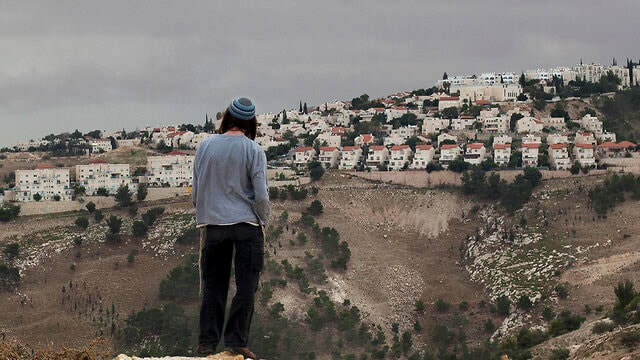 The report indicates that residents of the two ultra-Orthodox cities in the West Bank—Modiin Illit and Beitar Illit—received 6.6% of all support grants, despite the fact they represent only 2.7% of Israel’s population. Furthermore, the residents of the West Bank regional councils are also funded in a disproportionate way to their number. They recieve NIS 99.8 million, making up 9.2% of all grants, even though they make up 6.7% of resinders in regional councils in Israel. The biggest gap was evident in the budget to regional councils: NIS 144 million, which is a quarter of all budgets to regional councils in Israel, go to regional councils located in the West Bank, while these councils constitute only 5% of all the country's regional councils. “This report is really not a surprise,” Shaffir told Ynet. “It only repeats the data we have been gathered in the past years, and it’s only becoming more and more evident. “This is only the tip of the iceberg, since the report doesn’t include the budgets that are transferred outside the budget plan, like the Settlement Division’s budgets that are mostly invested in the West Bank settlements and not in the State of Israel,” said Shaffir. “This is the answer to Orna Peretz from Kiryat Shmona, who asked the prime minister where are the budgets for health facilities in the north. “There are many sought-for-budgets to be found in this report, budgets that the north has been waiting for for a long time,” Shaffir concluded.